I have enacted a personal rule that I'm not allowed to check a bag on a flight unless I'm traveling for over a week. A week you say?! Yep, a week. To some of you, this may sound crazy, but let me let you in on a little secret: you don't need to pack as much as you think you do. And even though our California trip was eight days long, I still packed only a carry on bag. Boo yah. Another reason I've enacted this rule for myself? Avoiding those pesky checked baggage fees (budget conscious traveler here, y'all) and the awful possibility of the airline losing my bag. Not paying the fees is my own little rebellion against paying upwards of $50 round trip in fees that many airlines charge. I'm already paying enough on my ticket alone; I don't need to pay extra when I can just pack efficiently and leave a few non-essentials at home. It also saves time in the airport. No more waiting in line to check a bag on the front end, and you don't have to waste your time at the baggage carousel once you get to your destination, or when you're tired from a trip and just. want. to. go. home. So how do I do it? I've come up with a list of my top packing tips to share with you today. I hope this will help you avoid some of those annoying checked bag fees too, which really start to add up if you're traveling as a family! 1. Before you open a drawer or closet door, make a list of what you need based on the number of days you're traveling, activities planned, and the weather report. 2. Pull out everything you need, and then put back anything unnecessary. Make your clothing multitask. For example, you probably don't need a different pair of pants/shorts/skirt for each day. Instead, decide on a couple of go-with-anything bottoms and mix them with a selection of tops. Dresses are also great for travel if appropriate for the climate and activities because they don't take up much space! Mix and match people. And one of the best parts about traveling? No one, except the people you're traveling with, will notice if you wear the same items multiple times. I promise. Sorry to burst your bubble, but they also probably don't care all that much :). 3. Use accessories to change up the look of an outfit. If you're worried about variety, bring a few colorful scarves or pieces of fun jewelry to vary your look. This way, you'll get the variety you crave without the bulk of extra clothing. 4. Be picky about what shoes you actually need. I took four pairs of shoes on our California trip, and you know what? I only actually needed two. Shoes are often bulky and hard to pack. Quick tip: if you're taking running shoes, stuff your socks into their insides to utilize that "dead space." Plus, you also won't have to go digging for them later. 5. Find out if you'll have access to a washer/dryer where you're going. This can obviously be a game-changer. You can pack even lighter! 6. Don't bring a hair dryer. For me, this is a hard-and-fast rule unless I know absolutely that I won't have access to one, and know I'll have to blow dry my hair. Hotels always have them. If it's not in your room, ask the front desk. I do often travel with my flat iron since it's much less bulky and I get the same effect of blow drying once my hair air dries. 7. Keep a quart size bag filled up with travel size toiletries handy at home. That way, you'll always have those things ready to go and you can just pop them into the outside pocket of your bag. You'll have to pull them out when you go through security, so keep them accessible. 8. Use your "personal item" as overflow space and for your in-flight essentials. This is the item you can bring on board with you in addition to a larger suitcase. I usually pack a tote-sized bag for my personal item and bring a small purse (which I tuck into my tote during boarding to avoid dirty looks from the security people/gate agents). My laptop or iPad, a couple of magazines, a sweater or jacket, and a snack go in the tote. I try to leave a little bit of extra space in case I decide to buy something in the airport or while we're on our trip. You can push the limits on the size of this bag, but double check with your airline on the maximum size because some can be picky and make you check one of your bags (the horror!). 9. Invest in a quality rolling carry on. I don't mean spend hundreds of dollars, but go to a place like TJMaxx or a department store (I've had great luck with huge sales at Macy's) and get a lightweight suitcase that has quality construction. I got a Diane Von Furstenberg suitcase from TJMaxx for around $40 three years ago and it's held up great. If it's made to airline carry-on specifications, you should have no trouble fitting it easily in an overhead bin. That'll save you a few stressful moments on the plane ;). I much prefer a rolling bag to a duffle-style bag. I find it easier to drag than carry one through those long airport terminals (sometimes I wonder if I'll ever get to my gate). 10. If you happen to be flying an airline that doesn't charge for a bag (i.e. Southwest or JetBlue as of the publishing date on this post), feel free to check one if you want! I still generally chose to carry on even with that option available so I don't lose time on either end, or risk having the airline lose my bag. And that, my friends, wraps up my top tips for packing a carry on! So tell me, are you with me on carrying on as often as possible? Or are you firmly in the checked bag camp? No judgment here :). It's all about doing what works for you! Do you have other packing tips that I missed? Thanks for your tips. We try to fit everything in one carry on roller board suitcase. When we took our children to Europe for two weeks I started shopping TJ Maxx months in advance and got everyone a good quality suitcase on wheels. We try not to check luggage when possible. It does simplify things. Great tips!! Thanks for sharing at my Weekend Beautiful Blog Party! Be aware that European "budget" airlines EasyJet or RyanAir have stricter carry on restrictions than we are used to in the States. I took an LLBean "carry on approved" rolling duffel for my 10 day Central Europe trip when I was living in Paris...yeah no. I had to check it at the gate and paid an extra 80 euros to do so. My advice would be to avoid flying within Europe at all if you can - the train is way better & you get views! When packing clothes, roll everything rather than fold. This saves an amazing amount of space. If you have a clear small fold out toiletry bag (I like Vera Bradley's) you can just open it out on the security bin which also saves time. Great tips! I didn't know about the stricter carry on rules for European flights, so that's great to know. Rolling clothes is helpful as well, but in my experience, it works better for some materials than others in terms of wrinkles. Anything that doesn't wrinkle easily is the perfect rolling candidate :). Hope you have a great week! I just returned from a 7-day trip to Chicago. I packed about 5 days worth of clothes and could've done with 4 days worth. All you need is to mix and match the clothes! Also, I find that it's much easier to pack lighter when traveling to warmer places as you generally need clothes with less bulk. 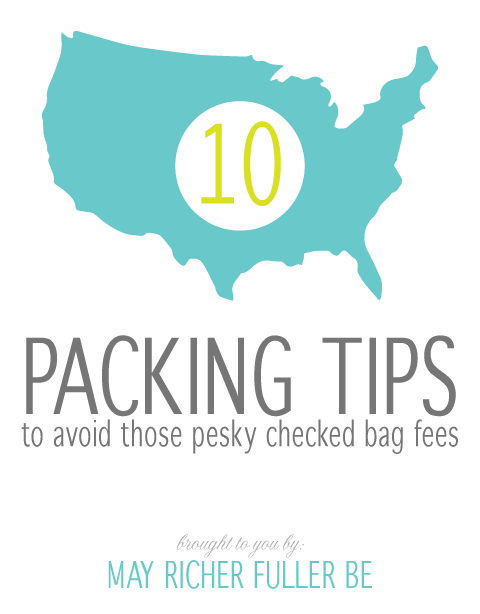 However, vacuum seal bags are great space savers when traveling to colder climates. And I generally wear my bulkiest shoes (i.e. sneakers) on the flight to save more space in my carry-on. They are also easier to walk in when getting to the gate dragging your wheelie along. Great post! ~M. Great tips! And you're so right - it's definitely easier to pack lightly for trips to warmer places than cold! The Best Vacuum Sealer worked great! Additionally I now use the Vacu Vin coffee and nuts vacuum seal containers to store my bags of paint (that I store in sacks of seran wrap sealed with rubber bands). It is an additional way to keep the paint usable indefinitely. You had a brilliant idea! Thanks for passing it along.Fantastic! Vacuum sealing is all I do too. However, I feel like we home cheese makers really lose out on the complex flavorurs and textures of aged cheeses that are naturally aged. In particular, the drier a cheese gets, the saltier it becomes. Without that saltiness, I'm often left wanting a more definite taste of 'sharp' than I can get from a Best Vacuum Sealer aged cheese. Extremely useful simple elements given by you here, this publish without doubt makes clear crucial tips to its visitors. click here if anyone interested in vacuum sealer reviews.